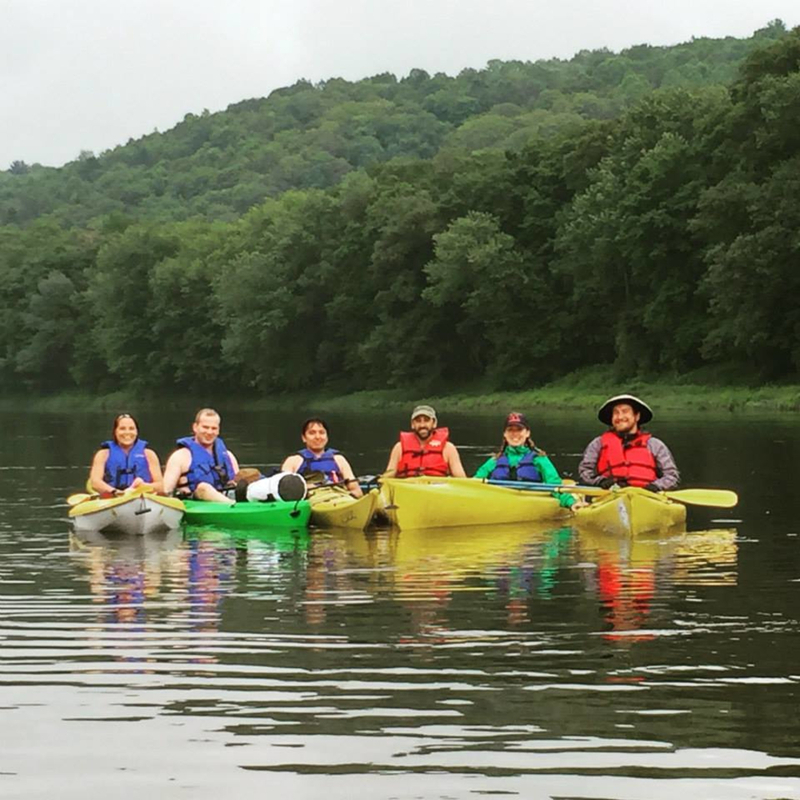 Seven of my closest friends and I set off on a three-day kayaking and camping expedition down the Delaware River over July 4th weekend. 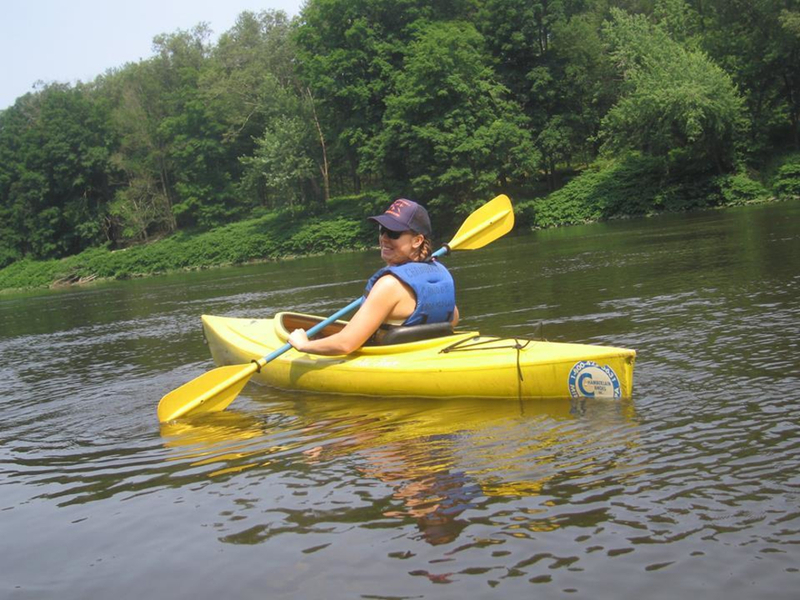 We woke up at the crack of dawn on Friday to make the two-hour trek from Philadelphia to the livery in Shawnee-on-Delaware, where we picked up our kayaks and hitched a ride upstream to Milford. We had been planning the trip for months, and were well-prepared with camp food, water shoes, waterproof dry bags, a water filter, iodine tablets, and more. The livery warned us that inexperienced paddlers were not advised to go out on the high, fast moving river, thanks to the the heavy rains during the previous week. I was nervous to go out as a first-time kayaker, but I knew with my strong swimming skills and adventurous instincts I would be OK. When we finally got on the water, it could not have been a more perfect day. The 80-degree temperature and sunny skies on fast water made for a relaxed first day of the trip. We all were shocked that we barely had to paddle because the river was moving so fast. This made upstream paddling nearly impossible, so we were cautious to ensure we all stayed fairly close together. We passed around trail mix and beverages and had a wonderful first few hours on the river. The livery also advised us to make camp early, since the free first-come, first-served campsites provided by the National Parks Service tended to fill up early on busy holiday weekends. 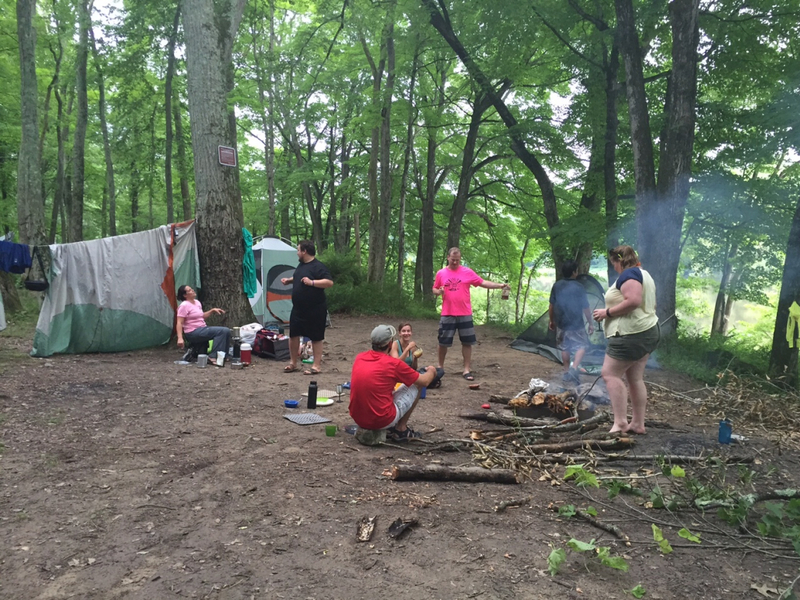 Around 3 p.m., we pulled off to a large site in Dingman's Falls, Pennsylvania, and decided to set up camp in the large clearing. The first evening we built a strong fire with fallen wood from the surrounding area, and cooked chicken and sausage kebabs over it. We sipped on boxed wine and sang songs around the fire until our eyes drooped heavily, then made sure to hang our food and trash in a tree before retreating to our tents for the night. On Independence Day, we awoke to the sound of steady rain on our tents. Not wanting to leave the comfort of my dry, warm sleeping bag, I watched daddy long legs crawl on the outside of my tent and I reveled in the peacefulness of the sound of droplets hitting the rainfly. Around 10 a.m., we all emerged from our separate tents wearing various forms of rain gear and broke down camp in the drizzle. As we set off on the river Saturday, it was quieter and less crowded than the day before thanks to the rain. 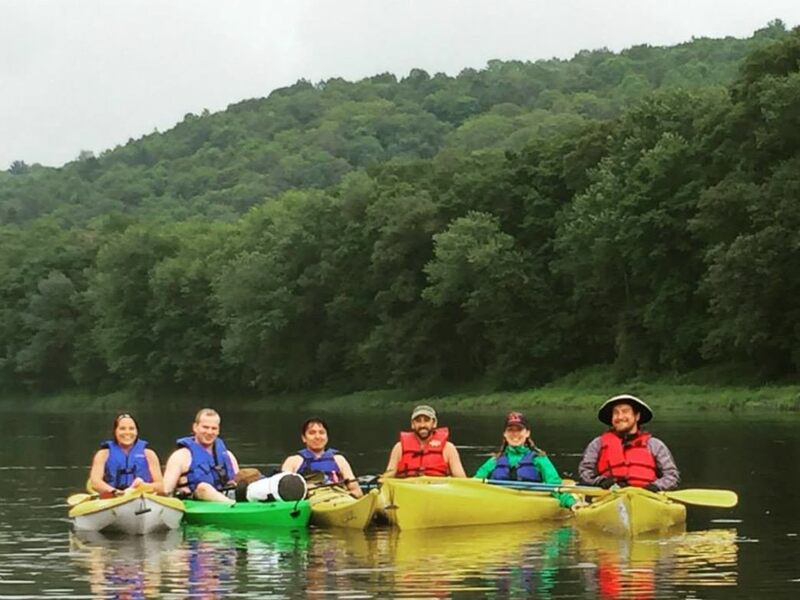 Someone from our group spotted a bald eagle flying to its nest, and we all paddled over to glimpse the beautiful raptor perched boldly on a branch overlooking the Delaware. We recognized the significance of seeing the bald eagle on Independence Day, and I felt overcome with emotion and pride. As the day went on, the rain cleared and the sun came out, turning a bleak morning into a gorgeous afternoon. We paddled about 20 miles over the first two days, which seemed a lot shorter thanks to the fast moving river. We made camp later on Saturday, on the New Jersey side of the river. We were all pleased that there was a latrine at this site, which seemed like quite a luxury at the time. As I led the charge into the woods to gather firewood, I shrieked as I stumbled over a big pile of bones and a skull, which I soon realized were from a deer. It sent a shiver down my spine and I retreated back to the campsite with my guard up. I quickly realized we forgot to hang our food and trash as I gazed deep into the eyes of a baby black bear—the cause of the rustling sound that awoke me at 4 a.m. on Sunday morning. If it wasn't so cute and I weren't so in shock, I probably would have screamed. Then I realized the mother would be lurking nearby, and quickly zipped up my tent window, and woke up my husband who was sleeping heavily. "Josh, there's a bear outside and I think it's eating our trash," I said with a panicked tone while shaking him awake. He instantly woke up and said, “Well, what are we supposed to do?!" I shouted to our friends' tent directly next to us, "Janine, there's a bear outside, What do we do?!" She didn't wake immediately but once she did, she said we should probably make noise to scare it away. We spent the next 20 to 30 minutes shouting, singing, and making sure our other friends across the site knew that they shouldn't get out of their tents. When we finally got the nerve to stick our heads out of the tents again, the bear was nowhere in sight. But that didn't mean we weren't on edge. I couldn't fall back asleep knowing the baby and mother were somewhere out in the woods, even though we were the ones infringing on their home. Once the sun rose, I fell back asleep and dreamed only of bears. The next morning, we found our bag of sandwich bread torn up and nibbled. Turns out, baby bears love white bread. Sunday was another perfect weather day, but we had about 14 more miles to cover and the water was moving significantly slower than the previous days. We made up for all the paddling we didn't do on Friday and Saturday, and soon our arms were tired and we were sweating hard. 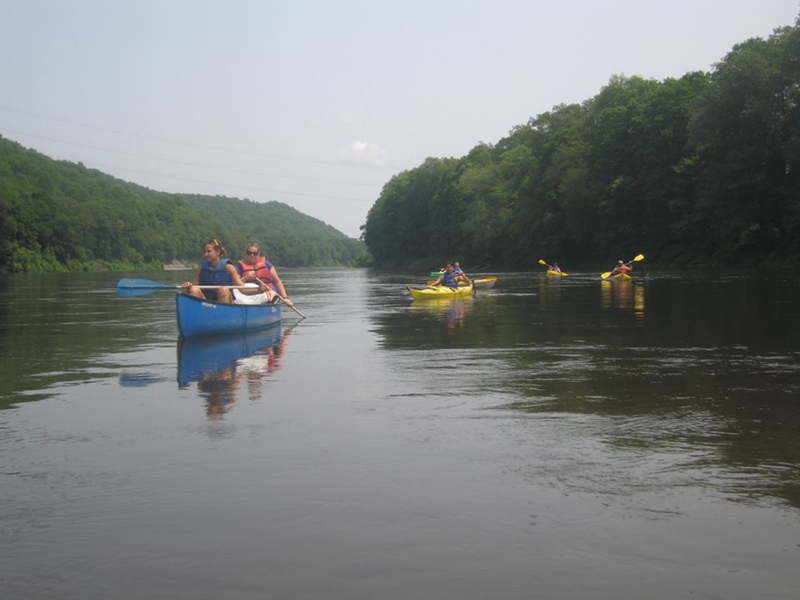 Nonetheless, we saw two more bald eagles and made our way through some fun Class I rapids, adding to the excitement and adventure of the trip. 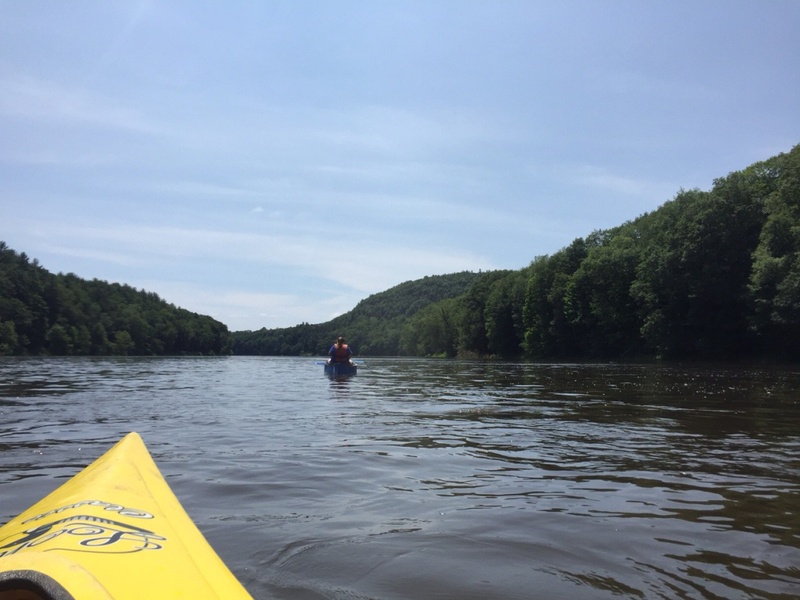 When we pulled up into Kittatinny Beach and got out of our boats at the end of our 34-mile excursion, I was both sad that the trip was over but happy to be heading back to civilization. We all decided we would be back to do it again next year, but that we would definitely remember to hang our food next time.